This last summer I had to purchase new tires for my ATV. It was a little bit of work to choose a tire so I thought I would share some advice and help. Choosing the right ATV tire is like choosing which food to eat at a buffet. The choices are many from stock tires to specialty tires used for dirt, race track, mud, snow, sand and even street. There seems to be an endless amount of debate about what tire is best. With all these options it’s tough to figure out what tire to buy. The first distinction is the type of ATV you have. 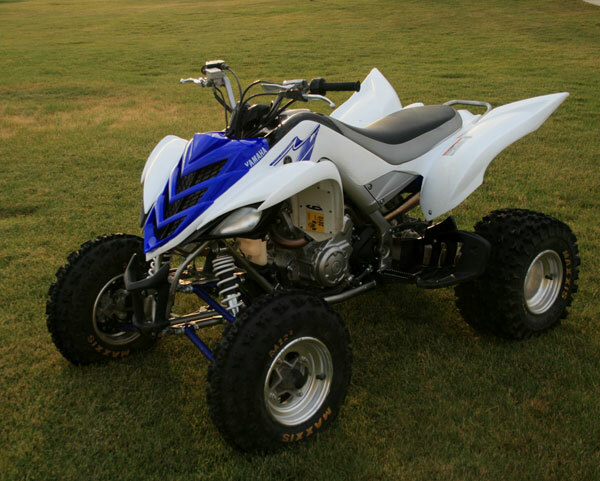 The two types of ATV’s are sport or 4 wheel drive/work atvs. The sizes on these two different atvs vary drastically. I own a 2007 Yamaha Raptor 700 which has a tire size on the front of 21 x 7-10 and 20 x 10-9 on the rear. My wife rides a 2008 Yamaha Grizzly 450 with 25x8x12 front and 25x10x12 rear. This is where I admit a dirty little secret. I was once a car tire salesmen. The biggest question I got from tire buyers was what does the tire size mean. The sizes used on atvs are recreational/atv sizes meaning instead of being measured in millimeters it’s in inches. Let’s use the example of my front tire. size 21 x 7-10 . The first number is the tire height. The tire is 21 inches tall. The second number is the width of the tread. The width from each side of the section of tread is 7 inches. The last number is the wheel diameter. My front wheel is 10 inches in diameter. 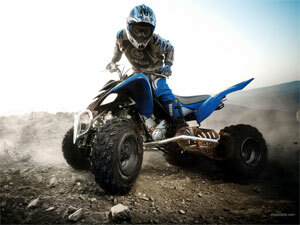 Sport ATV owners are divided essentially in to two types of tire either All Terrain (AT) style or sand. The AT style has several different styles. They revolve around racing or trail riding. The racing tires usually are softer and lighter. Racing tires need a softer rubber and more flex which usually means they are less durable. Sand tires are referred to as paddles because of their paddle wheel design. Sand tires are only meant to be used on sand. Trail riding tires are designed to be stiffer and tougher. The trail tires are heavier because they are 4 or even 6 ply tires. This makes them more resistant to punctures on rocks, thorns or whatever. Utility tires are different. The tires are usually more aggressive for mud, rocks and snow. These ATV’s are much heavier and see a lot of more rugged terrain especially since they are popular with hunters. Utility ATV’s tires are usually much more aggressive. The tires are also taller so that the ATV’s can crawl over a variety of terrain and rocks. My tires were really worn out last season. So I had all winter to think about and research what tire I wanted. The tires were going on my Raptor and I needed all 4 tires. I spent the winter reading all the ATV forums that I could find. I spent time looking in different ATV magazines at price and tread patterns. All my research led me to one conclusion and I know this is going to sound wishy-washy but I am going to be honest. 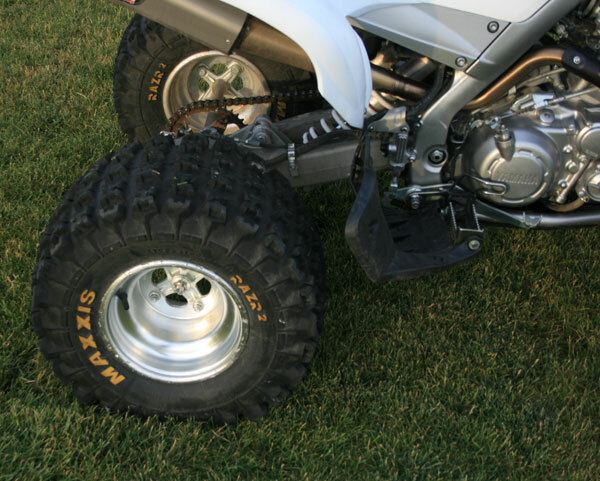 There really wasn’t much difference in quality and price from any of the major ATV tire manufacturers. I based my decision on two things. The first was my style of riding which is fast trail riding that involves a lot of sharp rocks. This meant that I wanted a 6 ply tire. I knew it would be heavier and cost a little more but I have had enough flats that it was worth my piece of mind. The second thing was tread design. I wanted one that was thick and aggressive. 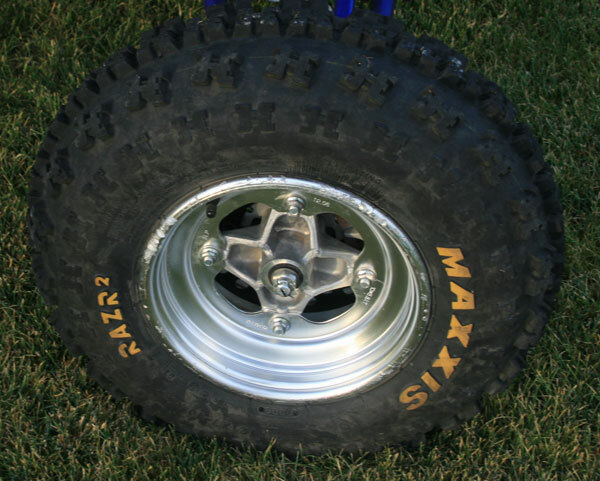 My choice was Maxxis Razr2’s. Maxxis tires fit the bill perfectly. I went and looked at them in person and I was sold. I am a visual person and like to see products in great detail, like in person since web doesn’t always do products justice. I purchased my tires from Rockymountainatv.com. I am a believer in purchasing locally if possible. Rockymountainatv is a local business here in Utah so I drove down to Spanish Fork and purchased them in person. RMATV was nothing but professional. If you live in Utah you should visit their showroom if not order their free catalog. It is huge and is an adult version of the Toys-R-Us Christmas Wishbook.